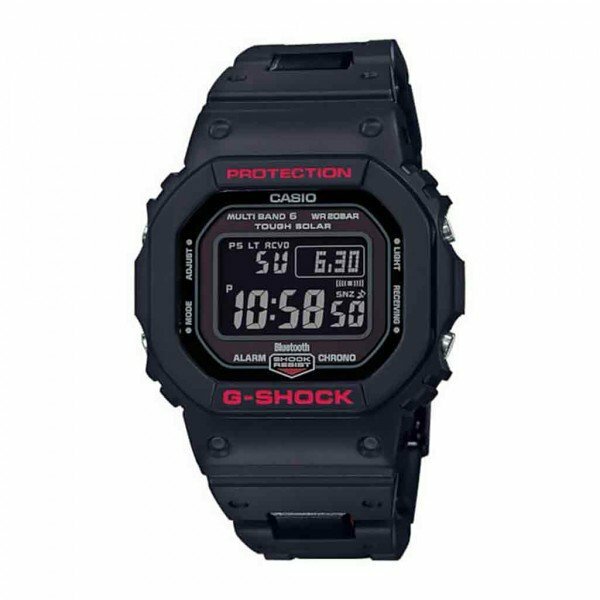 This new GW-B5600HR comes with a new type of band and carries on the proud tradition of the distinctive square design 5000/5600 Series, which still maintains the same basic form as the original DW-5000C. The outer segments of the band are made of resin embedded with metal parts, while the center segments are made of lightweight, highly durable fine resin. The inner surfaces of the center segments are colored with striking red for a distinctive accent. A one-press three-fold type band buckle makes fastening and unfastening quick and simple. Function-wise, this model is designed for outstanding timekeeping accuracy using Bluetooth? data communication and MULTIBAND 6, which supports automatic time setting adjustment based on one of six time calibration signals around the globe. Time information also can be acquired from an internet time server using the G-SHOCK Connected* app running on a smartphone. Other functions include Tough Solar in combination with CASIO original power saving technology that delivers a stable supply of power, high-brightness Full Auto LED illumination, World Time, and more. Use of an advanced engine makes it possible to achieve high-density component mounting without affecting the size of the finished timepiece. This and much more creates a modern timepiece that delivers the perfect blend of looks and performance. 5 World time Displays the current time in major cities and specific areas around the world. The new GW-B5600 Connected Engine models feature the distinctive square design of the 5000/5600 Seri..